Want to impress that special somebody in Stardew Valley? Or maybe you’re just looking to make sure every NPC is treated nicely. There are plenty of items that you can give as a gift to villagers within Stardew Valley so it can be a bit confusing figuring out which item is well generally well received along with the items that are a total waste of time. Don’t fret, you won’t have to risk lowering the relationship level with any of the villagers after checking out this list of the best to worst well received items to gift. Villagers absolutely adore receiving these items, but they are also the hardest items to come by. Prismatic Shard – The Prismatic Shard is a rare and powerful substance with unknown origins. This mineral can be found while mining and is worth 2,000G. Rabbit’s Foot – Produced from a Rabbit, villagers will find the rabbit’s foot to bring luck. Generally these items make for a pleasant gift item. All gems besides Prismatic Shard which is considered a universal loved gift. All cooking except fried eggs, bread, wheat, and hops. Coffee – Found within The Saloon. Apple – Found on fruit trees. Apricot – Found on fruit trees. Orange – Found on fruit trees. Peach – Found on fruit trees. Pomegranate – Found on fruit trees. Cherry – Found on fruit trees. Maple Syrup – Collected through tapper. While they might not love it, villagers certainly won’t hate receiving these items as a gift. Fried Egg – Cooking based item. Bread – Cooking based item. Wheat – Farming based item. 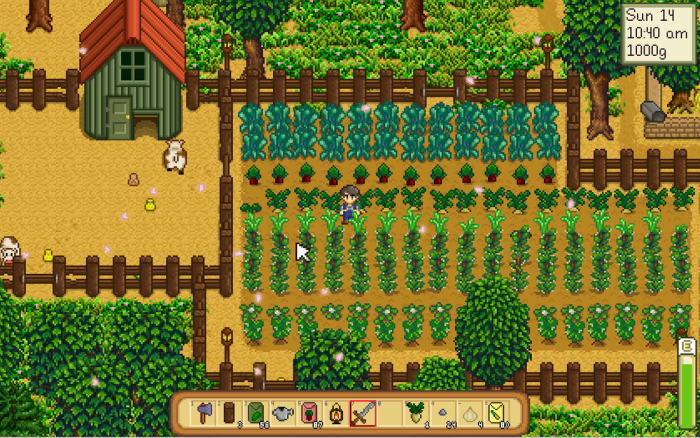 Hops – Farming based item. Cave Carrot – Foraging item within mines. Driftwood – Piece of wood collected through fishing. Wheat Flour – Ingredient collected at Pierre’s. Oil – Cooking oil collected at Pierre’s. Vinegar – Fermented liquid ingredient collected at Pierre’s. Rice – Grain collected at Pierre’s. Field Snack – Crafted food item. Frozen Geode – Mining item. Magma Geode – Mining item. Omni Geode – Mining item. Oak Resin – Fragrant substance created from oak sap and collected through the use of a tapper. Pine Tar – Substance created from pine sap and collected through the use of a tapper. Salmonberry – Spring-time berry found within the forest. Avoid giving these gifts out at all costs as these items will turn away villagers. Weeds – Collected through foraging. Sap – Collected through various trees. Hay – Animal feed bought from Marnie. Sea Urchin – Ocean spiny creature found on beaches. Red Mushroom – Spotted mushroom found within caves. Rusty Spoon – Common rusty spoon. Rusty Spur – An old spur from a cowboy’s boot. Rusty Cog – Old preserved cog from old machinery. Chewing Stick – Old sticks individuals chewed on to keep their teeth clean. Carp – Common pond fish. Seaweed – Collected by fishing. Green Algae – Collected by fishing. White Algae – Collected by fishing. Snail – Mollusk that can be collected by fishing. Poppy – Flower with culinary and medicinal uses. Copper Ore – Common mining ore.
Iron Ore – Common mining ore.
Bug Meat – Bug flesh. Slime – Gelatinous glob that is considered a monster drop. Batwing – Wing from a bat that is considered a monster drop. Oil of Garlic – Beverage that can be crafted.